The best accessory to any outfit is... a smile, of course! As an avid coffee drinker, teeth whitening and the quality of my pearly whites has always been a concern for me. I always use a whitening toothpaste and have tried numerous whitening strips in the past. The strips worked somewhat for me, but didn't last long at all, and they only covered the front few teeth. I had always been frustrated by this, because my smile is only of my favorite features and feeling good about that makes me feel extremely confident overall. Keep reading for a giveaway opportunity and coupon code! When Smile Brilliant reached out to me, it was the perfect opportunity. The process was seamless, efficient, easy, and fun! The results were even greater, and before I had even finished the entire process, people were already commenting on how nice my teeth looked. To start, I received a box with all the tools necessary and pamphlets on how to do everything. The first step of the process was to create molds of my teeth using the pastes and trays provided. This was probably the scariest part for me because I was afraid of making my molds too thin or too much. However, the instructions made it suer clear and they gave extra pastes just in case. After this, I sent in those trays and waited about a week and a half for my custom-fit trays to be sent to me. When I got my retainers, the actual teeth whitening process was a breeze. The product came in syringes which made application onto the retainers very easy and was great product design! The instructions say that 1 syringe can last up to 3 days of whitening, however I found that I really didn't need to use all that much and could use one syringe for even longer - more bang for your buck! I started off leaving the whitening gel in for 45 minutes at a time, and slowly started increasing up to an hour and a half (you could go up to 3 hours if you wanted, I just didn't have the time!). 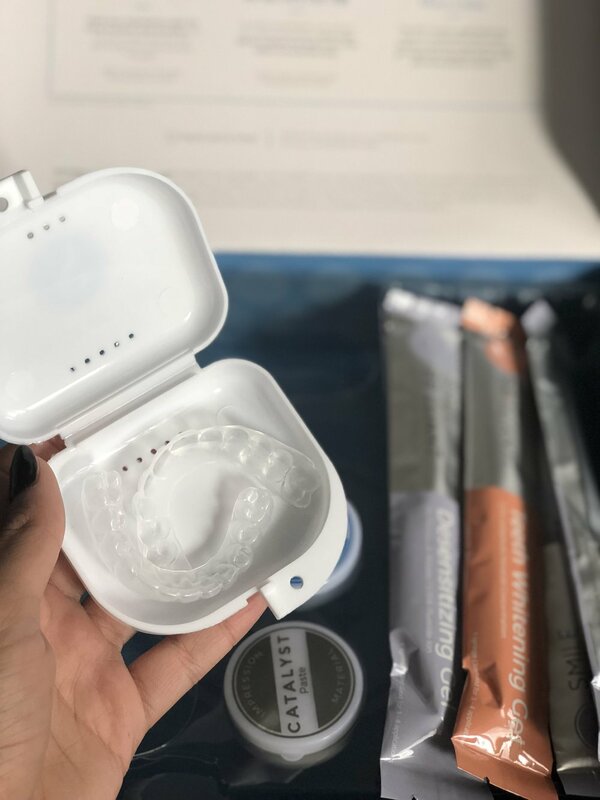 After the whitening gel, I would brush my teeth and wash the retainers to put on the desensitizing gel for 15-20 minutes. This part of the process I greatly appreciated because the first few times, I did feel my teeth getting sensitive, and this really helped. Overall, I really enjoyed this experience. The only downside I had was the time commitment involved in the process, as 2 hours can be a lot. This was an issue for me only because I tend to be out of the house most of the day, and come home at night when I'm already exhausted. However, I found ways to work around it such as doing the strips when I was winding down for the day, watching TV, or even doing at home workouts. Multi-tasking was definitely the way to go. BUT, that’s not all! In order to try this out for yourself, I have a giveaway for you all! All you have to do is go to www.smilebrilliant.com/g/gurbanibedi to enter for $149 Smile Brilliant Credit! If you just can’t wait, you can also use the coupon code gurbanibedi15 for 15% off the website! And with that, I hope you are inspired for your pearly whites!